I think it's becoming my habit that before going to travel anywhere, I always do some little research. 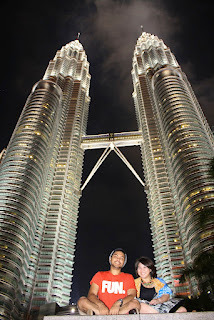 So did with this trip to KL and Singapore. The same treatment was also applied to my previous plan to Japan. (Well... Okay, no more talking about Japan!) Research is really important to determine your itinerary. 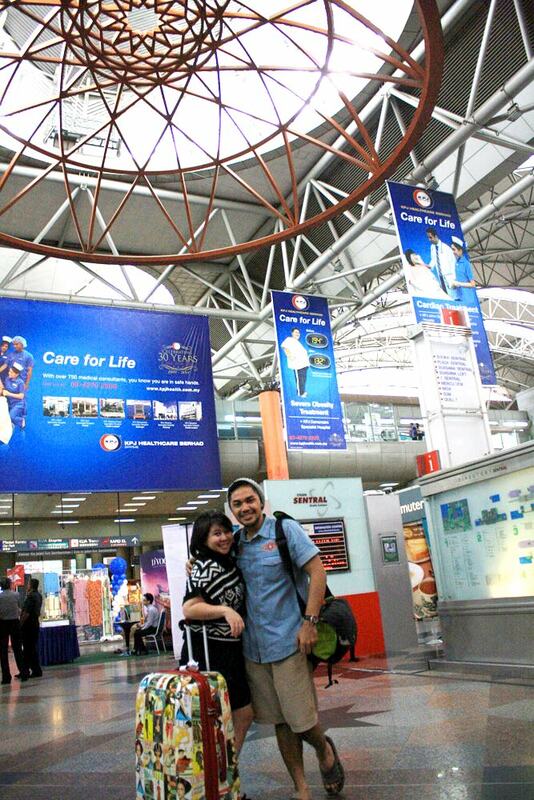 And for me, successful trip is when I can make the most suitable, doable, and comfortable itinerary. The research began with the people's recommendation of places that I should visit, or things I should do. 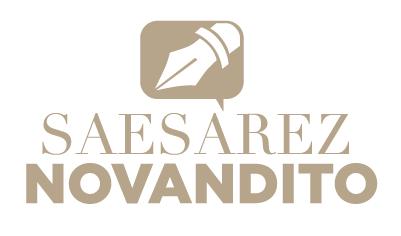 These things I could get from reading blogs or traveling forums. Second step, After I decided the places I want to visit and things I want to do, then I could decide the area of the hotel to stay. The distance and accessibility of the hotel to your destinations is really important so you won't waste your time getting to those places. To help me knowing these informations, I used Google map. Then you would know whether you can take a walk or using any public transportations. Researching about the public transportation becomes my third step. This includes all the informations you need to know: What type (bus, train, monorail, or MRT/LRT), direction, fares, stations or shelter you should get into or get off, etc. After finish with that one, then you are ready for the fourth step, book everything that you feel you need to book. 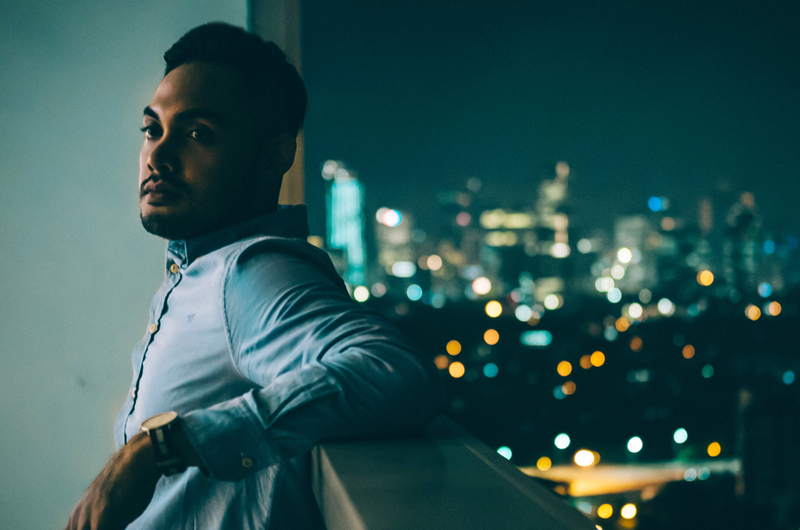 The more booking you've made for your requirement before the trip, you will feel more secure. 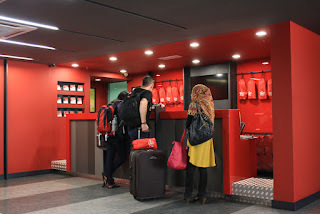 For our trip, we booked the Hotel in KL, and the bus from KL to Singapore via internet. The Universal Studio ticket, we already purchased it from Jakarta through travel agent. The flat that we rent to stay in Singapore, we booked it by phone and transferred the down payment later. My girlfriend, Chika, posing at the arrival hall of KLIA's satellite building. The trees outside the glass wall is the mini-jungle I am saying about in the text. After passed the immigration check and collected our baggage, then we decided to had our lunch at the airport, before we went to the city. And Burger King was the choice. BK in Malaysia and here in Jakarta has a few different menu. But I was surprised when Rani asked for a mayonnaise, they said they will charge us for 50cents (1/2 Ringgit or about 1,500 Rupiah). What?? Dude.... like, seriously? I know it's cheap, but it's damn free here in Jakarta, you know!? =_= So, not even a single drop of extra mayonnaise was given that day. Hahaha.... Done with the lunch and munch, then we heading to the city. 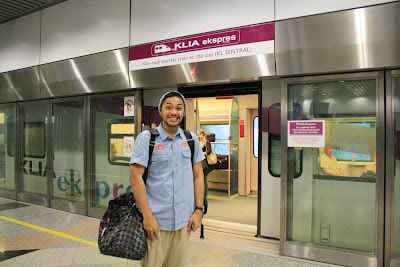 From KLIA which is located in Sepang, it would take about an hour riding a bus to the KL city. 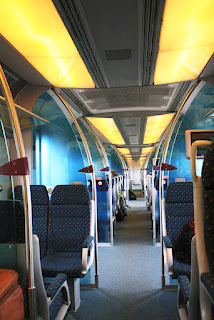 But, if you have extra budget, I recommend you to use KLIA Ekspres. 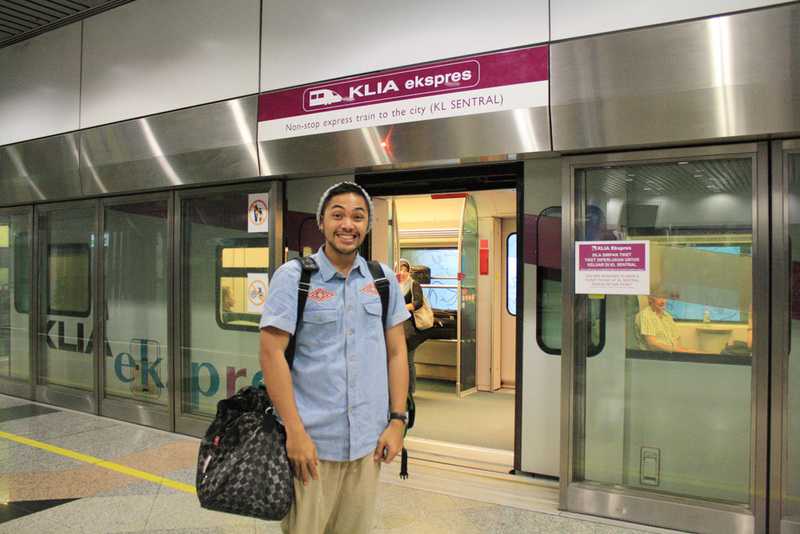 A train that will deliver you to KL Sentral station in only half an hour. The interior of the train looked very modern, and it had a lot of spaces to put your damn large baggage. ;). Just go to the lowest level (level 1) of the airport and you'll find the departure platform of the train. The departure platform of KLIA ekspres. 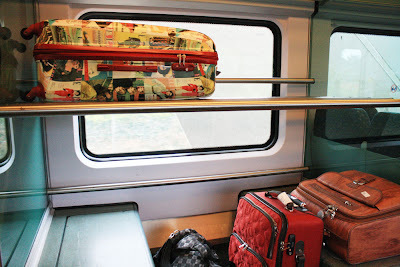 The train moved really fast and after approximately 30 minutes we arrived at KL Sentral station. From this station you have most of the access to any part in KL. Our next destination was our hotel, Tune Hotel, which was located near to Medan Tuanku monorail station. 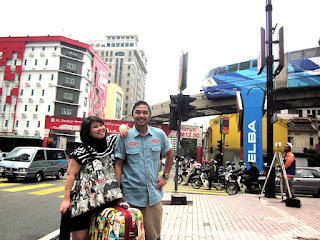 And like what I have researched before, we can easily access the KL monorail from KL Sentral. But, unfortunately, the bridge that connects these two stations was under renovation. It means we have to get off from the Station and walk to the monorail station. 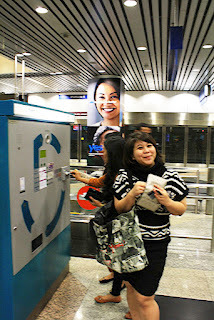 Then we had to walk through the dark and dusty bus terminal in the underground of KL Sentral station as the exit. 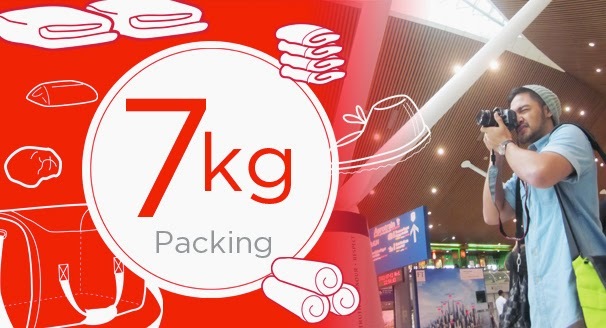 With a large baggage like my girlfriend brought, it was not convenient way to do. Plus, we have to climb the stair to get into the monorail station. But I can tell that riding monorail was really enjoyable, suddenly I imagined and wondered when would Jakarta has a comfortable public transportation like that. Arrived at Medan Tuanku station, then we continue our walk to the hotel which was already seen once we get off the station. 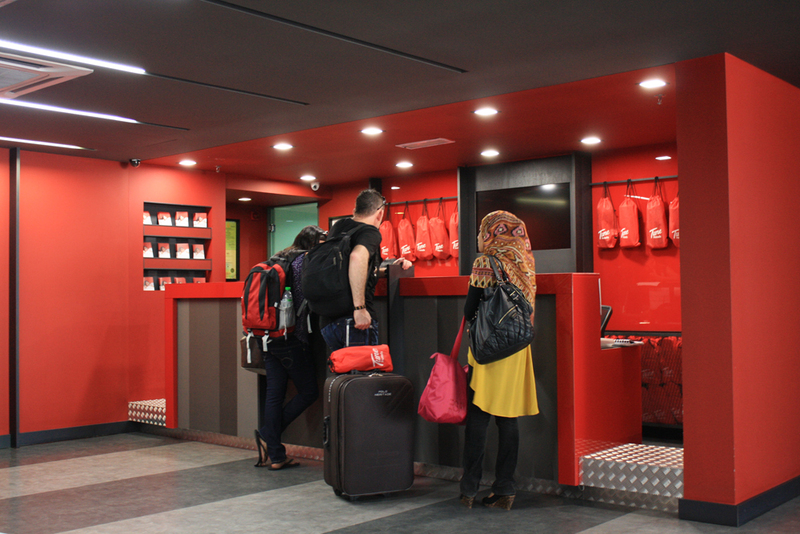 Tune Hotel in downton KL is located at the side of the main street, so it's very easy to reach. This 7-story building was very prominent by it's lively red color that becomes their identity. The check-in process was very easy, we just have to show the booking code that I has been emailed once the purchase done. What you have to do is just print it out and show them. 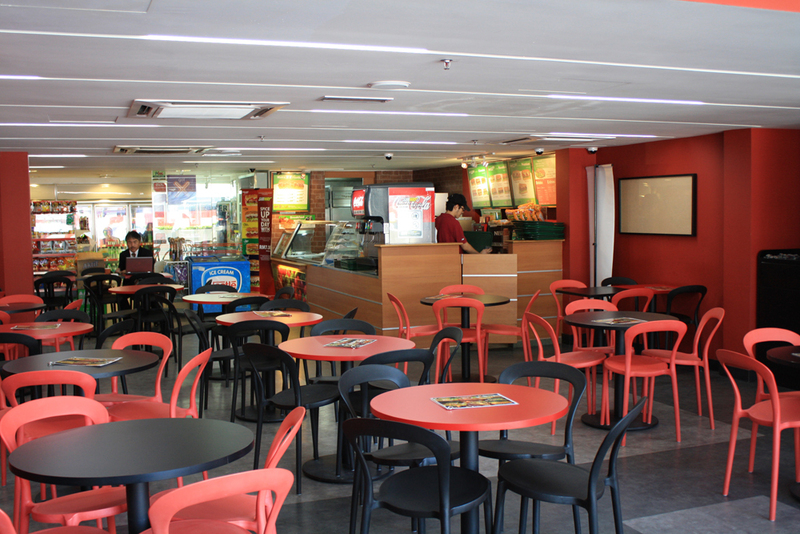 As a budget hotel, just don't be surprised that every facility you can have at other full-serviced hotel freely, in here you have to pay. Or they call it as an "add-on" facilities. The price shown in the internet was only the basic fare. It includes only the room, and the hanging fan. So, for the Air conditioner I already purchased the add-on when I booked via internet. For the AC facility, there are two types: 12-hour and 24-hour credit. Well, since we stay less than 24-hour in the hotel, I take the 12-hr credit. Other add-on facilities that is not included to the price or it means you can purchase later is: early check-in, late check-out, TV, wi-fi internet, towels and toiletries. But overall, Tune Hotel is recommended. 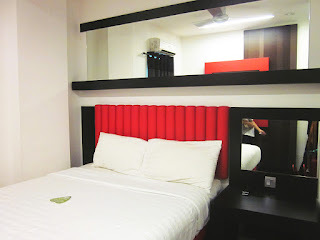 The room and the bathroom were small but acceptable, the bed was clean and comfy, and though this hotel didn't serve breakfast, they have 7-11 convenient store, Subway (sandwich bar), and Sri Kulai (ready to eat malay dishes). The dining area of the hotel. After checked-in, then we took a shower before we heading to Dataran Merdeka. 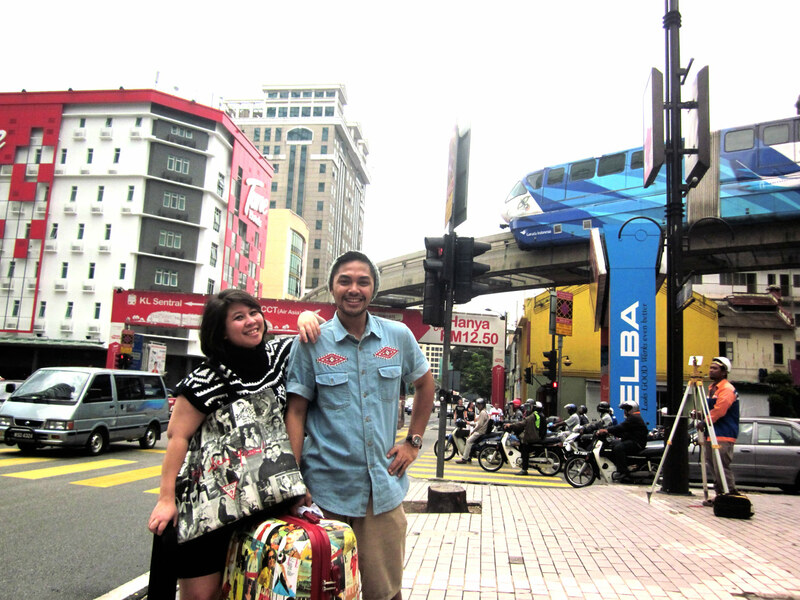 We used monorail from Medan Tuanku to Bukit Nanas, then interchange to Dang Wangi LRT station. From Dang Wangi, we take Kelana Jaya Line LRT and stopped at Masjid Jamek station. 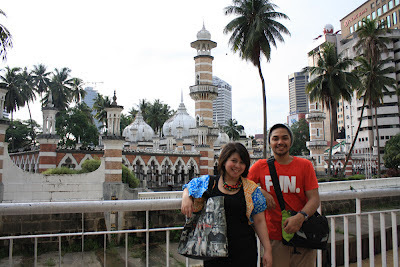 Once you get off the station, you'll see one of the oldest mosques in KL, Masjid Jamek or Jamek Mosque. It is located at the confluence of the Klang and Gombak River. 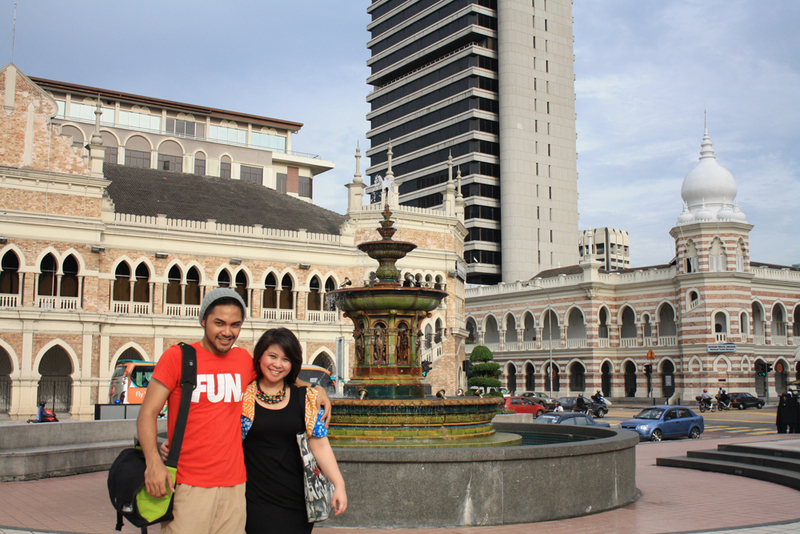 From this station we took 10-minutes walk to reach Dataran Merdeka. 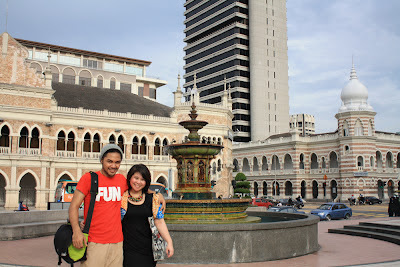 Dataran Merdeka or Merdeka Square is a very famous spot in KL, which is the heart of british colonial building heritage. The most well-known and iconic building there is Sultan Abdul Samad Building which was inspired by Indian "Moghul" architecture. This building is now used for the office of Ministry of Information, Communication and Culture of Malaysia. At the south part of the field, there is a 95-meter flagpole, one of the tallest in the world. It was here where Union-jack flag was lowered and replaced by the Malaysian flag for the first time on August 31, 1957. 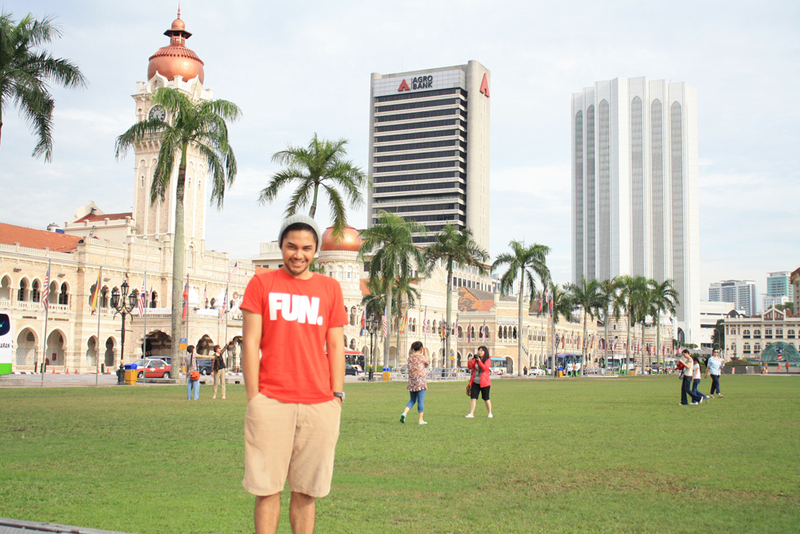 Since then, this place has been the usual venue for National Day Parade. 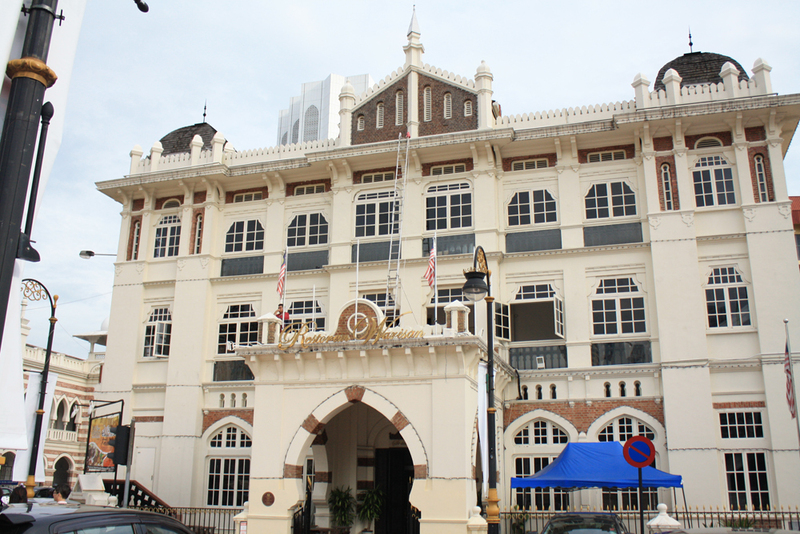 There are several colonial heritage building to see beside the Sultan Abdul Samad Building. Some of them are National History Museum, Kuala Lumpur Gallery, Royal Selangor Club, and Textile Museum. Done taking pictures in front of those adorable historical buildings, then the girls could not hold their desires to shop any longer! Well, Bukit Bintang is the place. 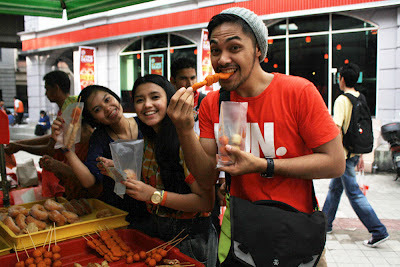 On the way we walked back to Masjid Jamek station, we felt a bit hungry after exploring Dataran Merdeka. And when we saw there was a food hawker just beside the station, we stopped by. They sold skewed fried-snacks like nuggets, sausages and meatballs for 1 Ringgit each. The situation at the station was really different with the first time we arrived there couple hours before. It was after-office hour already. The station was really crowded. We took Ampang Line LRT from Masjid Jamek station to Hang Tuah. And then at Hang Tuah we interchange to the monorail platform. 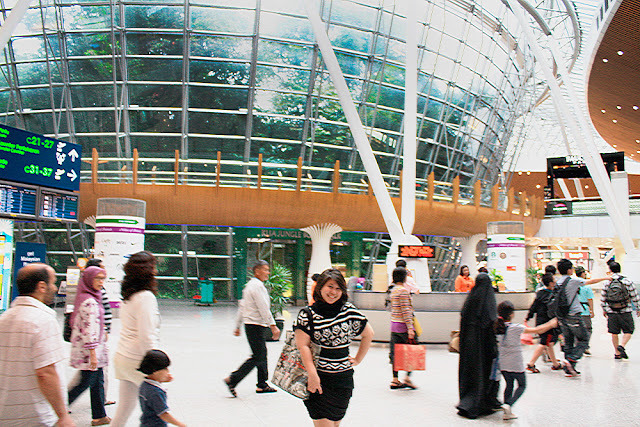 Bukit Bintang monorail station is just two station ahead from Hang Tuah. Arrived at Bukit Bintang, the atmosphere was very lively. There was some malay teenagers doing street performances, while some tourist taking pictures. You can see there are some familiar brands had their store here in this area. But the girls had no store to visit in Bukit Bintang, but Vincci. And this shoe store was not becoming the destination of my girlfriend Chika, Rani, and Nene's only. It was the destination of every girl in KL. It was damn crowded!!!! While the girl drowned in the sea of Vincci shoes' discounted price, I chose to take a walk to the other store around Bukit Bintang. And I saw Uniqlo! Wohoo... It's my turn to shop. After we satisfied shopping, we felt really hungry. And we went to Nasi Lemak on the street side just behind the Fahrenheit 88 building. The price was quite cheap, even cheaper than the street food in Jakarta. It only cost like 5 Ringgit or around 15,000 Rupiah per person. Our next destination is the twin tower, Petronas. We have no more energy to walk to the monorail station. So we decided to use Taxi. Taxi in KL was not like what we have in Jakarta. The car that they use were mostly old cars and not in good maintenance one. They never use the taxi-meter, even when they have a sticker in the car stating: "This is a metered taxi. Haggling is prohibited". Yeah right.... But since the fare he offer was still made sense, so we took it. 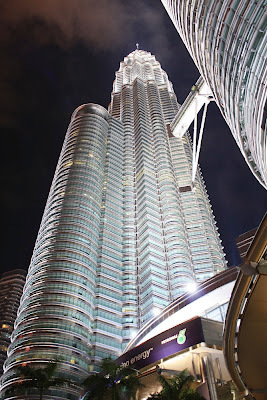 Arrived at KLCC and watching the twin tower at night was really incredible. 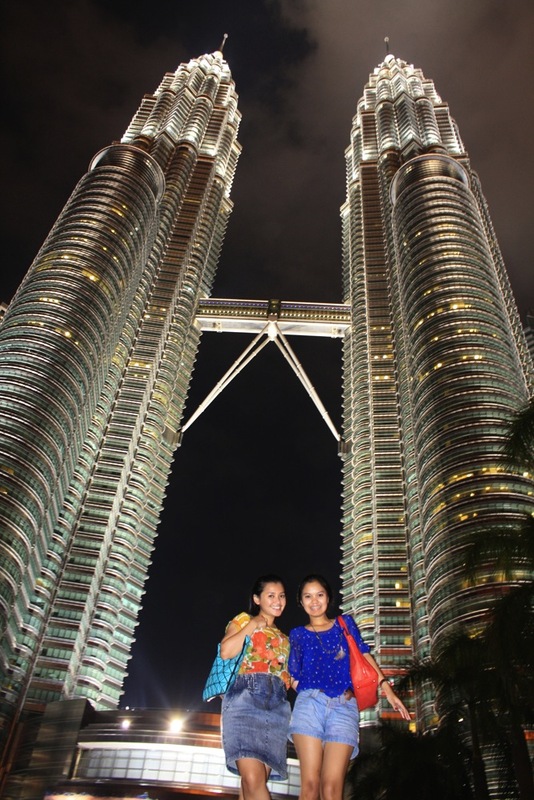 I think it's better to take picture in front of it at night rather than at day. The lighting that casted into the building was really interesting. And after we took some pictures in front of it, it's time to went back to the hotel. Yes, by taxi. In fact, our hotel was close by. 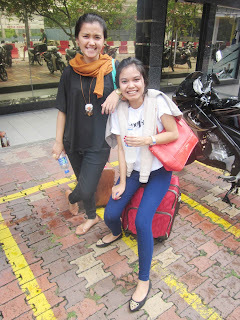 But since we were exhausted already and carrying those shopping bag, hiring a cab was the best way.